What is… What’s Hub Lunch? 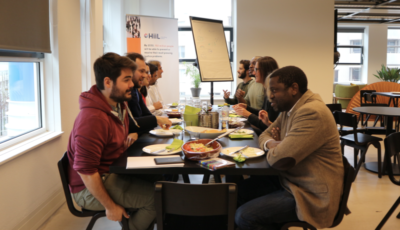 A regular lunch-time gathering where Hub members share a meal, while getting to know one another better. Each time, a different member will act as a host during the meal and facilitate the interaction between participants in a fun and relaxed setting. Every first Tuesday of the month! Join us for the What’s Hub Lunch in the Hub Cafe, on the 3rd floor of the Humanity Hub. To have a healthy lunch. To get to know your fellow Hub members and welcome new faces. To introduce yourself and share your story that brought you to the table. This event is meant for Humanity Hub members. If you are interested in our activities and membership options, please check our programme and feel free to drop us a line!